The Scottish Labour party and the Scottish government are at loggerheads over the number of people from deprived areas going to university. 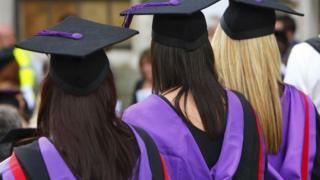 Labour have claimed the gap between the the number of students from the richest and poorest areas has widened. The government insisted the number of 18-year-olds from deprived areas going to university was at a record level. It recently appointed Professor Peter Scott as commissioner for fair access to higher education in Scotland. His role will be "to support disadvantaged learners and drive change across the system". The Scottish government has said it wants to see a big rise in the number of people from deprived areas who go to university. Labour argue that, over the past two years, the gap between the number of students from the richest and poorest areas has actually widened. The party says that while the number of young people from the most deprived areas going to university has gone up 0.8% since 2014, the number from the least deprived areas rose more than three times as fast. The Scottish government says the number of 18-year-olds from Scotland's most deprived areas going to university is at a record level - but wants further and faster progress. Scottish Labour's education spokesman Iain Gray said: "Nicola Sturgeon has promised that every child, regardless of their background, would have an equal chance of going to university. "But those chances have become less equal while she's been first minister. "It goes to show that warm words from the SNP aren't enough, closing the attainment gap will take more investment in our schools. "Labour will continue to make the case for a 50p top rate of tax on those earning more than £150,000 a year to invest in closing the attainment gap in schools across Scotland." The Scottish government said Ucas figures recorded the highest university entry rate for 18-year-olds from Scotland's 20% most deprived areas. A spokeswoman said: "In 2006, 18-year-olds from the 20% least-deprived areas were 5.8 times as likely to enter university as those from the 20% most deprived areas, and this has decreased to 3.9 times in 2016. "It is welcome news this is heading in the right direction, but we are committed to making further and faster progress on fairer access to higher education for all, as the recommendations made by the commission on widening access are implemented." The spokeswoman added: "Professor Scott's appointment is part of a wider range of work aimed at ensuring that, by 2030, students from the 20% most-deprived communities will represent 20% of entrants to Scottish universities." Is university funding in Scotland in crisis?